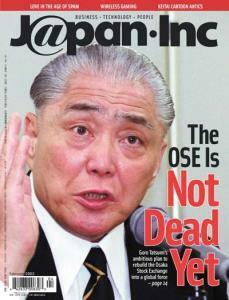 Tatsumi's struggle to rebuild the OSE is one of many recent examples of change percolating in Japan. The odds may be against him, but I wouldn't count him out. In 1999, while trying to come up with a name for our new technology magazine, we hit upon J@pan Inc. When, oh when, will the myth of "lifetime" employment be laid to rest? Tokyo Govenor Shintaro Ishihara is not alone in trying to diversify the source of local government's revenue, but he has a special way of getting public attention. Increase in foreign direct investment on the cards? Lets see if Koizumi can translate his words into action. "We believe that the fashionable notion of a Japan in inexorable decline is misleading," the council's task force says. Sumitomo Mitsui Banking is thinking of buying all of the approximately 49 percent stake that finacially troubled Softbank holds in Aozora Bank. Trading houses shift from being all-around elites to focused middlemen. Issey Ogata and Kaori Momoi look at the dark side of life in Japan and laugh about it. New Zealand's pristine countryside is dotted with camera crews. The latest craze is turning yourself into an animated character. KDDI's song clip download service could be the next hot item in mobile content. Why are the banks reacting so strongly to the supposedly watered down Financial Revival Program? 'Gamemaking God' Turns to the Small Screen But will his sports games make it in Japan? People like to play games, move and communicate. And this all points to a potentially large market for interactive gaming on mobile phones. Goro Tatsumi's ambitious plan to revive the Osaka Stock Exchange post-Nasdaq may just work. Alex Stewart reports. Online dating sites prove that looking for love is a recession-proof industry. Transpacific alliances are all the rage in the booming business of wireless gaming. The cable TV audience grows, but profit is hard to come by. What the right-wingers are singing, talking on your keitai, and the cost of picking up garbage.